I have been a professional channel for 30 years. I channel Sananda, Kudos, 7 Spirit Dolphins and Lela, my High Self. Over the years I have received very specific guidance for my spiritual growth, healing and everyday life problem solving. I became accustomed to receiving this wonderful helpful guidance, when all of a sudden it stopped. This was a very challenging time of my life as my daughter and I were caretakers of a 2,000 acre ranch. She was only 10 years old, and we were pretty much on our own discovering how to live in the country and take care of horses, chickens, dogs, cats, a hamster and a bunny, while assisting the owners in developing the ranch. I was feeling this is not the time for my channeling to stop. In a very real sense it hadn’t stopped, it had changed. I found I had many synchronicities each day and was moved to be right where I needed to be each day. I was feeling happy and peaceful as my daughter had always wanted a horse and one of my dreams of getting to know wild animals “personally” was coming true. Several times the same owl would greet us as we drove up the two-mile dirt driveway. It would fly right alongside us. We grew to know and be familiar with badgers, hawks, wild boar, a fox, a weasel, skunks, bobcats and, of course, our farm animals. The presence was so tender and loving that I felt very foolish at not recognizing that during this time period I was getting guidance from the still silence. My own intuition was stronger, and I was growing spiritually. After this day, my channeling resumed and I began to receive very specific guidance again, but it became more a part of my whole self– the feeling of always being connected and cherished by the Divine presence within me. 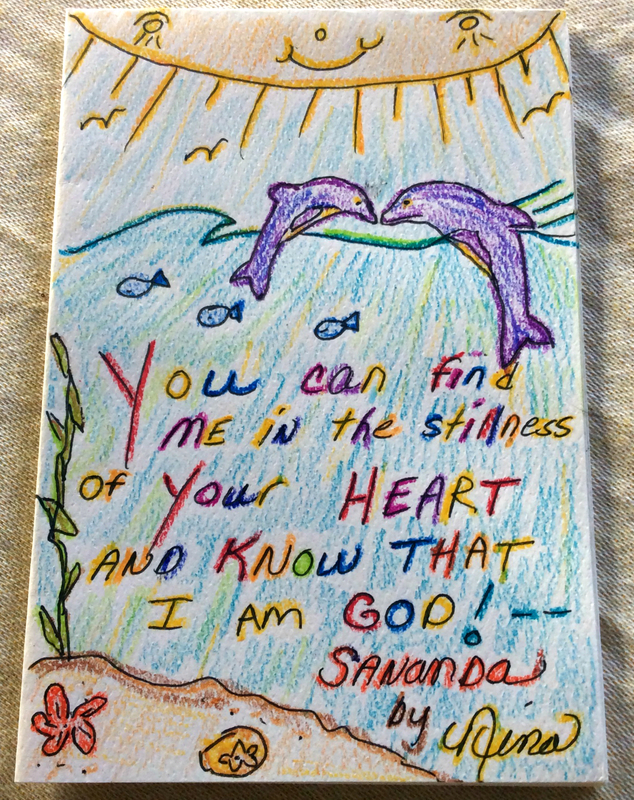 “Be still and Know that I Am God” has become a practice and preamble to my channeling. So, I highly recommend the stillness that can be found within you while walking, doing the dishes, gardening or doing just about anything. Peace, joy and love will shine through you as that is who you are. What is a bridge of love-light? In the 1970s I attended Sacramento City College. My political science professor always walked very fast and determinedly into the classroom while almost shouting at the same time “so what, who cares, and what does it matter”? He got our attention and the phrase has stuck with me all of these years when I am teaching or writing to ask that question of myself before I begin. What is a bridge of love-light, who cares and what does it matter? A bridge of love-light has infinite possibilities and is defined more by its result than concrete form. In fact it is often but not always found in the inner and invisible realms of thought, feelings, words, beliefs, concepts, consciousness, Spirit, and the Divine. Wow, that covers a lot of ground. Intentions and affirmations can sometimes also qualify. Laughter is a universal bridge as is smiling and beauty, art and kindness, and of course selfless generosity. When you feel lighter, more compassionate and more joyful you have likely experienced a bridge of love-light. They are most often very individualized as we are all so unique. The beauty of an orchid or a song, or view of a child playing may send chills up your spine but be “lost” on another. So you can see, the what and “so what”? Is infinite. Well, being a light worker I care and hope you will too when you see how important these often simple bridges are to create. Catching a negative thought and changing it to a positive one, or simply noticing it and letting it go is a very powerful light bridge that affects you and those around you in a very beneficial way. We learn in “A Course in Miracles”(Foundation for Inner Peace) that realizing we can see peace instead of a negative thought or situation does create miracles. As Robert Frost has taught us taking the Road less travelled does make all the difference. Caring by its nature is a bridge and is Love. Since you are reading this, you of all people know it couldn’t matter more as you are a light worker and a bridge of love-light simply by your being upon the Earth at this time. Sananda teaches us as the children of the Divine that, Beingness is supreme. When we are being the love that we are, we can’t help but create bridges of love-light in our own worlds that in turn light the whole world and All. What matters most now is that you enjoy the fruits of your labors of creating the bridges of love-light that have helped humanity awaken to their Divinity. To realize you and your, friends, family and humanity are not separate from Divine Love is the very best effect of creating bridges of love-light that anyone could hope for and achieve. Some of my own favorite light bridges: smiling at strangers from my heart center, flowers, singing, swimming, teaching, meditation, eating organic raspberries, giving fairy tea parties, making and sharing bread and cakes, watching sunrises and sunsets, being with my family, trees, nature, favorite books, the Ellen Degeneres T.V. Show, Arbonne products, dogs, horses, cats, the Ocean and, Love, love love practicing gratitude and sharing my joy. Plus more. You can see the list is infinite. My bridges of love-light for you are that you enjoy life, have fun, feel free, and receive all of the love, joy, health and wealth that are here for you.